This PDF 1.5 document has been generated by Microsoft® Word 2016, and has been sent on pdf-archive.com on 06/02/2017 at 20:58, from IP address 98.10.x.x. The current document download page has been viewed 511 times. File size: 581 KB (6 pages). • Team Member: An individual member of a Team and their 1000-point detachment. Armies each game that will operate independently. using the Force Organization Chart and available upgrades as detailed below. • Team Members MUST use the same detachment throughout the tournament. • For ease of tournament play, the Death from the Skies dog fight phase will not be used. follow the rules and modifications presented below in the Team, Armies and Warlords section. the updated rules presented in Planetary Onslaught. Armour Value 15 buildings are not allowed. Formation may not take up more than 500 points (50%) of the Team Member’s detachment. War may not make up more than 500 points (50%) of the Team Captain's detachment. 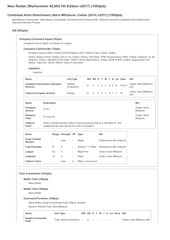 Thirteenth Legion 2017 (for now use https://docs.google.com/spreadsheets/d/1BmAGCdpzTGxKI6PvHEKZSuRnY01T1aocGmOtCqvK1Y/pubhtml#) Warhammer 40K Approved Imperial Armour Units document. devices, templates, and a writing implement. • The tournament will consist of Three rounds of play. 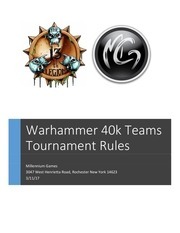 • Warhammer 40K Team Tournament Primer will be released March 3, 2017. • All players are expected to abide by the Venue’s Conduct Policy. • The models used in your army must comply with the Model Policy (all models MUST be WYSIWYG and 3- colors). removed from all subsequent play. Tournament points may be deducted and award eligibility may be forfeited. HQ and 1 Troop), one Team Member may elect to take an additional formation (max 500 points). Skitarii. These selections are not considered unique and may be repeated across a team. special rules but are otherwise treated as Battle Brothers. cannot field Inquisitor Coteaz twice. This also applies to upgrades to squads (e.g. Justicar Thawn). entirely of Chaos Deamon players can only have 1 Portaglyph per Army/table. multiple units bought in a single Force Organization Battlefield Role (e.g., Chaos Daemon Heralds). other players from the team on a different table. an Army but would not affect other players from the team on a different table. that particular piece of Wargear or Special Ability. 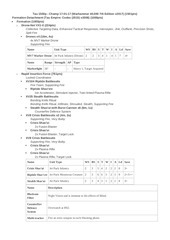 specific Wargear and Special Abilities are applied in Warhammer 40,000 7th Edition. allegiance. In all cases, the Warhammer 40K Team Tournament rules regarding Allies are still in effect. will always be a significant amount of skepticism surrounding the Inquisition! Army’s Warlord, but you will forfeit the Warlord Trait. All Warlords that are eligible to roll for a Warlord Trait may re-roll the result on the appropriate Warlord Trait table. as being slain for the purposes of calculating Slay the Warlord. Appearance will use The Thirteenth Legion Painting Rubric. Theme and Display will solely be up to the Three Judges to give points. Average of the Three Judges will be awarded. How do the Team Tournament Detachment upgrades work? Each Team member may select one upgrade to their standard Team Tournament detachment from the list provided. on that Team for any reason. How do Knights work in the Team Tournament? through appropriate conversions and modeling, or risk losing Team Theme and/or Team Appearance points. Renegard Knights may be selected for Heretical factions. How do Space Marines work in the Team Tournament? 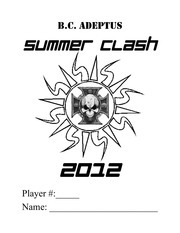 rule in the Warhammer 40K Team Tournament rules. Are Legacies of Glory/Ruin Allowed in the Team Tournament? Yes, a SINGLE player on a Team may select either a legacy of glory or legacy of ruin for a qualifying vehicle. slate. 1 Team Member may bring a single assassin using the +1 Assassin Choice upgrade option. How do Adeptus Mechanicus armies work in the Team Tournament? Adeptus Mechanicus books. Please note: the maximum of 1 fortification per team still applies. How does Mek Boss Buzzgob work in the Team Tournament? How does Zhadsnark Da Rippa work in the Team Tournament? 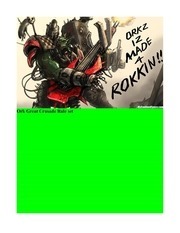 • If any army lists include war bikes as troops than Zhadsnark must always be the Warlord on every table he plays on. then it locks him in as your Warlord and costs you your warlord trait. This file has been shared by a user of PDF Archive. Document ID: 00549656.